Unemployment among recent PhDs has been in the news quite a bit lately. I am going to make a case for getting a STEM PhD by showing you the good, the bad, and the ugly. My stance is that a PhD can be a great idea even though PhDs are not as lucrative as they have been in the past. Jordan Weissmann wrote two posts in The Atlantic about unemployment among recent PhD graduates [Link and Link] and discussed these articles on NPR [Link]. The National Science Foundation collects the data at the time of graduation, and from what I can tell, their numbers are highly accurate based on excellent participation in their surveys. As far as operations research goes, IE degrees are in the “engineering” category and math and CS are in the “physical sciences” category. (I have done my own calculations on the NSF data that show the same trends. When I give seminars at universities, I like to share this data with students in a separate seminar just for students.) Here are two of Weissmann’s figures. Unemployment at the time of graduation by year of graduation. Unemployment at the time of graduation by the year of graduation. Jordan Weissmann implies that post-docs are not employed. Sure, this may count as underemployment, since many of those with post-docs would prefer something more permanent, but it’s slightly disingenuous to consider post-docs to be unemployed. Still, I think it is important to separate our post-docs from other full-time jobs as Weissmann has done. He also notes that American-born PhDs do somewhat better than foreign-born PhDs in the job market – Americans have higher levels of full-time employment. 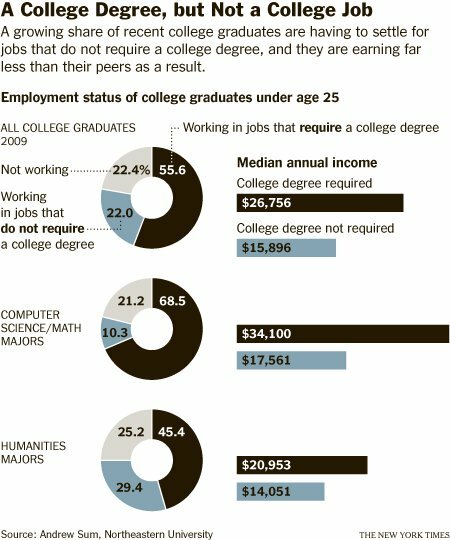 One reason that recent PhD unemployment levels are so high is because students may look for industry jobs after they graduate. Many find jobs immediately after graduation. This may be particularly true in fields like engineering, where more students than average get industry jobs (unlike academic jobs, industry jobs can be sought and found the summer after graduation). It’s worth noting that NSF does not track unemployment rates a year after graduation, so we don’t really know what happens. We can say that PhDs do not appear to have a problem with chronic unemployment. However, the data above show that it’s getting harder to find a job. It’s worth noting that between 2001 and 2011, the number of students graduating with PhDs increased from 40,744 to 49,010, an increase of more than 20%. This is a big increase in enrollment, and it seems to have affected employment opportunities. PhD graduation rates dipped slightly in 2001 (as compared to the late 1990s), and you can see in the figures above that 2001 was a good year for PhD graduates finding jobs. Megan McArdle writes about how there may be too many STEM PhD students [Link]. She is concerned that the growth in science PhDs is driven by grant funding and the need for post-docs rather than by the supply of jobs that require a science PhD, which can lead to unemployment after graduation. And that is probably a legitimate concern in some fields. She cites NIH funding, which doesn’t grow the pool of operations research and mathematics PhD students too much. When my current department started a PhD program, we had to justify why our graduates would get employed with the state of Virginia – and that was back in 2007-2008 when PhD unemployment was not in the popular press so much. To be honest, I don’t know what the state does about PhD unemployment rates – presumably nothing since they are just starting to track students graduating with Bachelor’s degrees. I do think that as a nation, we need to not push harder to grow PhD programs without growing jobs as well. These unemployment rates are depressing, but not getting a PhD may be worse. 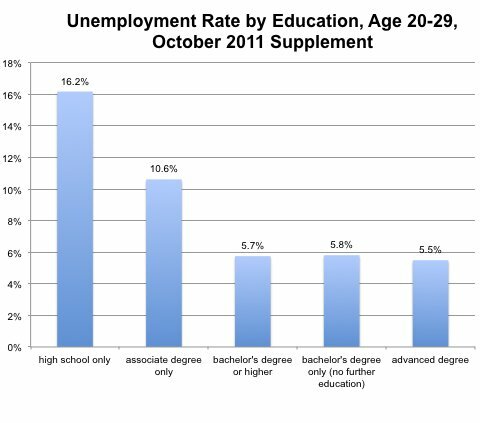 In another one of Jordan Weissmann’s articles, he writes that recent college graduates (BS/BA degree holders) have a 53% unemployment/underemployed rate [Link]. This seems horribly depressing. You can check the Bureau of Labor Statistics site [Link] for more statistics on unemployment/underemployed. Unfortunately, the BLS does not have many charts on education level. This one [Link] shows that unemployment for those with college degrees is now down to 3.8%, but that includes not-so-recent college graduates. Here is another figure on BS/BA graduates. 2011 unemployment rates for recent college graduates. It shows a 22% unemployment rate and hints at a high level of underemployment. Importantly, it shows that major matters. This unemployment rates is from ACS members, and they have a biased sample. Unemployed chemists are less likely to pay ACS dues and are thus less likely to get asked to fill out ACS surveys. Plus, those who are unemployed are less likely to answer the unemployment question. This is the same issue that universities face with their graduating students – those with jobs tend to fill out outgoing student surveys, thus skewing employment levels. Therefore, the ACS survey likely underestimates the unemployment rate. The bigger problem is that the survey is from all ACS members. We are concerned with unemployment among recent PhD program graduates. The ACS survey does not give any insight into whether newly minted PhDs can expect to get a job. However, a low PhD unemployment rate is consistent with all the statistics I can find. Here are a few other things to consider. First, the BLS shows a low unemployment for PhDs, which corroborates Lowe’s finding that PhDs can get jobs. But it doesn’t have enough information to show that recent PhDs can get jobs. Unemployment rate by education level. This shows that the unemployment rate for PhDs is 2.5% compared to 3.5% and 4.5% for MS and BS/BA degrees, respectively. However, this doesn’t give any insight into unemployment rates among recent graduates. Unemployment rates for recent graduates. Advanced degrees lumps together several important groups (MS, PhD, MBAs, etc), so it’s hard to tell what unemployment looks like for these groups. Given the ages considered (20-29), I’m sure that few PhDs were included in the “advanced degree” category, and therefore, their impact was diluted for better or worse. These figures look at unemployment rate but not income. In an article that I cannot find at the moment, those with Bachelors degrees have seen their income just keep pace with inflation over the past 40 years. Those with advanced degrees have seen their incomes grow faster than inflation (see this link for the concept). Industry jobs continue to employ recent PhDs. And industry jobs pay very well. It’s a stochastic process: what was true in the past may not be true in the future. It’s hard to understand the employment rates among recent PhDs, but from what we know, unemployment rates for PhDs are lower than those for students with lower levels of education. Chronic unemployment does not seem to be a systemic issue for PhDs, and PhDs make more than their BS and MS counterparts. I see these trends continuing in the future albeit to a lesser degree. Yes, PhD students lose out on potential income for 5-6 years when they are in graduate school, but they get paid to get a STEM PhD, so it should not lead to extra loans. I started a Roth IRA as a graduate student. Getting a STEM PhD is different than going to law or medical school in this regard, and I think this is a huge plus. Many universities were not hiring in 2009-2010. This led to more post-docs than usual. Universities are hiring again, and all those post-docs are ultimately getting full-time work. But recent PhDs often have to compete with post-docs for tenure track positions, which makes it harder for now. Eventually, this may work itself out. College is as popular as ever, and universities will need faculty to teach all of these students (although many are making do with instructors and adjuncts). And finally, field matters and the PhD program matters. The statistics above do not tease out those those who graduate from top programs (like top 10 or top 25). Students from top PhD programs are generally highly recruited – with some bias, I can recommend one stellar ISyE department for getting an operations research PhD. I recommend that students be very direct about employment options before they select a graduate school. Going to a top school makes a big difference for business school [Link] and law school [Link] – and it’s true for STEM PhDs, too. But if your employer is paying for your PhD, then this is less of an issue. Do you think that PhDs are still worth it? My post focuses on getting a PhD in the US – are PhDs still worth it internationally? If you have a PhD, would you get one all over again if you were graduating from college now? The Wall Street Journal reports that legislation will be introduced to identify which universities provide the most bang for the buck in terms of students’ employment prospects. See more here. With college tuition debt surpassing 1 trillion dollars and unemployment levels being relatively high after graduation, this is a serious issue. It’s alarming to know that employment information is not generally available to prospective students when they select a university. 1. Identification of meaningful metrics. 2. Data collection and analysis to support the metrics in 1. I’m not going to critically directly discuss metrics #1 in this post, but it’s a serious issue. After all, bad rubrics can lead to an explosion in the majors that score well in those rubrics whether it’s justified or not. Let’s assume that we can agree on some basic metrics, e.g., student loan default rates. Instead, I’ll discuss the challenges in data collection and communication, since these are core analytics problems. No progress can be made toward recognizing valuable universities and degree programs without analytics. How should a university collect data, analyze the data, and report the results to prospective students. Last year, Virginia lawmakers began requiring the State Council of Higher Education for Virginia to produce annual reports on the wages of college graduates 18 months and five years after they receive their degrees. Beginning this year, the reports must also include average student loan debt. The state data have shortcomings. Paychecks for the same job can vary widely by location. Salary data don’t reflect self-employed graduates or those who work for the U.S. government or move to another state. More analytics questions: How should data be analyzed regarding graduates who have gone on to graduate school? Students who are self-employed? What if many graduates go on to live in a city with a high cost of living and are paid more than there peers who live in more affordable places? Employment rates are a function of major as well as university (as well as other factors, of course). Assessing by major and university introduces new challenges. Small programs–like entomology and maybe operations research programs–are going to be hard to assess. They will likely be sensitive to outliers that can skew expected values and missing data. We may not be able to say a whole lot about entomology majors at a university due to too few data points. Can we infer whether this major is a good investment based on other factors? All of the tools I looked at for evaluating universities reported a single metric that reeked of expected values. There are few attempts to report a range or the uncertainty with the single metric. I suspect that this can be improved. Online retailers have done away with the average rating (based on 1-5 stars) with a confidence level based on the total number of reviews submitted. The confidence level is still conveyed as a single scalar value, but it’s more meaningful. How confident are we about the few entomology majors? Another concern with a single metric is that it does not convey what has happened over time. I see room for analytics here to recommend, say, when it’s worthwhile to consider law school again after there has been a substantial decline in law school admissions [Link]. This is a big issue since loan default rates (one possible metric) has gone up everywhere over the last few years but at different rates (see this college – default rates increased from 10% to 20% in three years. Others are less troubling). Trends over time are important. In terms of conveying information, this is hard to do at a university-wide level. Having said that, I like the chart below of public 4-year universities in Illinois. Having grown up in Illinois and knowing quite about about the public universities, I would personally rank the public universities there in ascending order of their student loan default rates, regardless of major. I’m less inclined to do so in Virginia, where some metrics such as average salary can be misleading. For example, George Mason University graduates can earn quite a lot because they often get jobs in DC, where cost of living is through the roof. They are not necessarily better off than students who get jobs at, say, Virginia Tech. Conveying information at the university level may be too coarse. I’ve checked out quite a few online tools for assessing the quality of different universities. The level of aggregation is sometimes alarming. This online tool does very coarse ratings at the state level. This is meaningless, because there are bad and good places to get a degree in every state, and they should not be aggregated. Some aggregation is necessary. This is an area where analytics can be useful: at what level should we report outcomes: at the state level, university level, college level, department level, or other (e.g., different regions or industries where graduates may get jobs). What role do you think analytics will – or should – play in evaluating universities?